What make up product can you NOT live without? If I knew I was about to be stranded on an island and I could only pack ONE make up product into my bag, I’m almost certain I’ll take my foundation along with me (though my brow kit is definitely a close second). I rarely leave my house without putting on foundation. Yes, even if I go to yoga first thing in the morning, I swipe on a light layer, just in case. In case of what? I have couldn’t tell you for the life of me. Perhaps its due to the fact that I’ve always been self conscious about my skin. I’ve never had flawless skin. Even now, in my mid-thirties, I break out, especially around my chin and my forehead. When I apply foundation and see my face transform into a velvety, smooth texture, it makes me happy. And when something makes me happy, I hold onto it with my dear life. 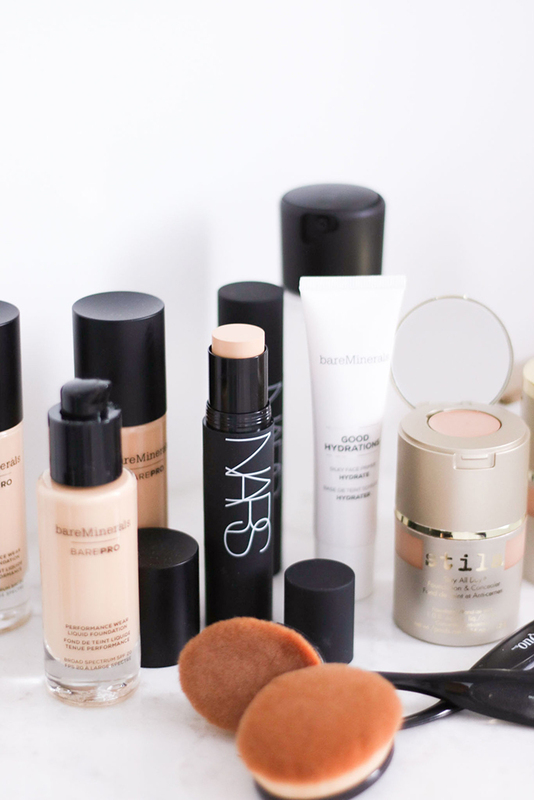 Today, I’m sharing three of my recent foundation favourites that are suitable for all types of coverage! I’ve used the Stila Stay All Day Foundation for years now. When they released the new Stay All Day Foundation with its coordinating concealer and a full skin colour range, I was stoked! The new and improved product now offers up to 16 different tones and the little built in concealer pot has been specially formulated with peach undertones to neutralize discolorations – can I say, genius?! The foundation, when pumped from the dispenser has a creamy texture, however, it is oil-free and offers a full matte coverage. Because the new product now offers colours in full range, I like to work with two different shades to create contour and definition (I generally use Honey (8), Medium (9), Golden (10), depending on the strength of my tan. Find out your own colour here). I also really enjoy the design of the dispenser, as all it takes is a pump and it avoids any spills and messiness. I like to apply the foundation with a brush and the concealer with my fingers for spot treatment. 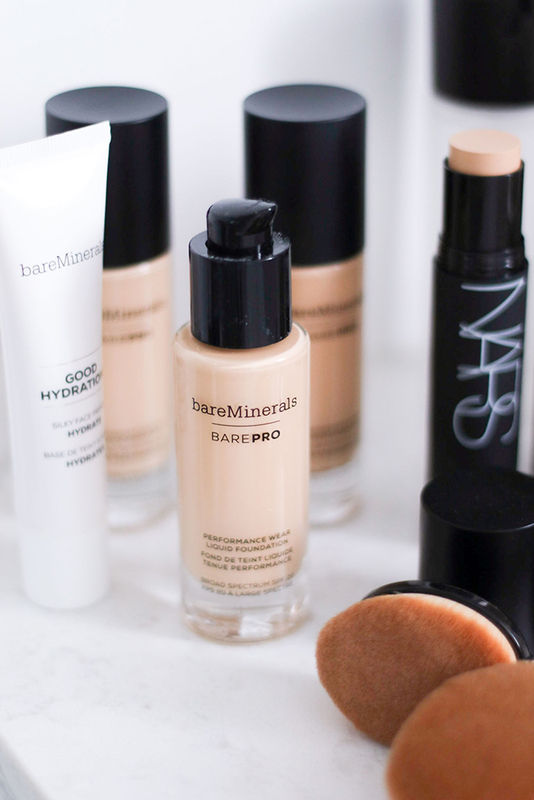 If you don’t typically wear foundation and in the market for something a little more lightweight but still gives you outstanding natural full coverage, I recommend the new barePRO Performance Foundation by bareMinerals. This foundation is a liquid mineral foundation which provides not only coverage, but overtime, the mineral also works to improve skin’s texture and ‘good-for-skin’ ingredients that won’t clog pores. In addition to all the goodness that this liquid foundation provides, it also provides a broad spectrum non-chemical SPF 20 that acts as sun protection, eliminating the need to apply another layer to the skin. If you find it a challenge to colour match, have no fear, because barePRO comes in 30 different shades, there ought to be one just perfect for literally, every skin tone. I am currently using PECAN (18) for the winter months, but anticipate that I’ll be selecting one or two shades darker when summer approaches again. Though many foundations are said to offer 24 hour coverage, after a long work day, I find myself needing to retouch before heading out again. 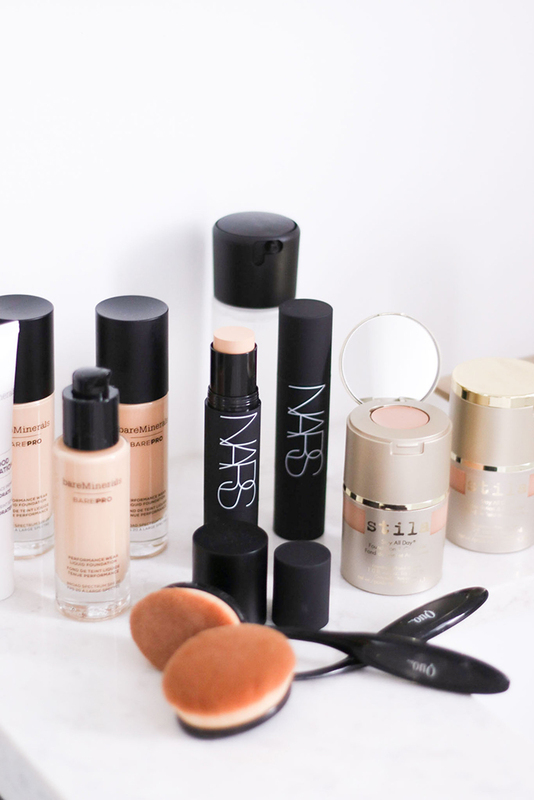 My secret weapon is the NARS Velvet Matte Foundation Stick. It’s a great option to tuck away in your purse since the size is compact and it is equipped with a built-in, Touch-Up Blender. I love using this to touch up under my eyes, around my chin and nose, where there is generally some redness and discoloration. The built-in tool is great for blending and the matte velvety texture melts directly onto the skin. The NARS Velvet Matter Foundation Stick is also another product that can be used for contouring and highlighting if you decide to purchase multiple shades. I’m currently using Barcelona Medium 4. Now that I’ve introduced a few great foundation options, priming and finishing are also equally important. People always ask me what the purpose of a face primer is. A good face primer will allow your make up to glide on smoother and also prolong it’s wear throughout the day. Since I have an oily t-zone and eyelids, applying a face and eye primer has helped significantly in terms of allowing the make up to ‘stick’. 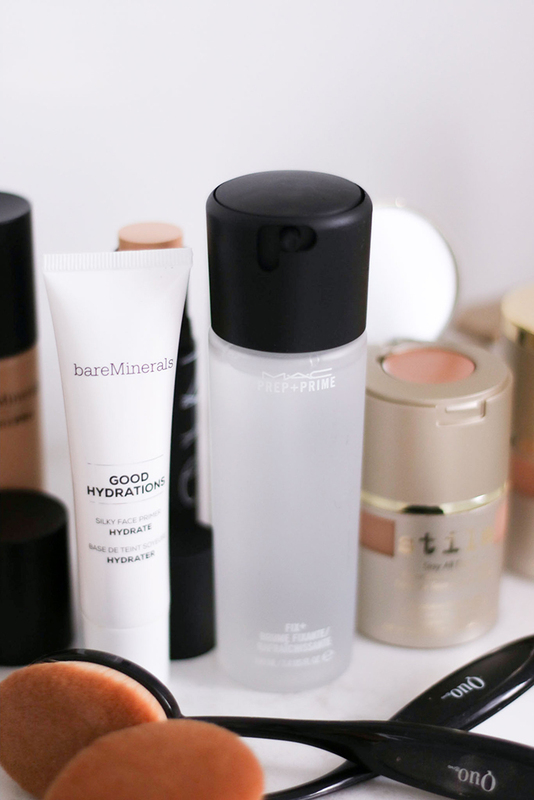 The bareMinerals Good Hydrations Primer is a fantastic little tube of goodness that has wonderful priming and hydrating powers. If you’re a frequent foundation user, you would know that even with a little bit of dry skin, your foundation can appear cakey. With a single dab of Good Hydrations (or if you prefer, all over your face), it will prime your face leaving it with a rich and silky texture. I’m really enjoying this product, it’s my first time trying it out, and found that it’s great as a standalone item before applying make up or layered on top of a regular face moisturizer. 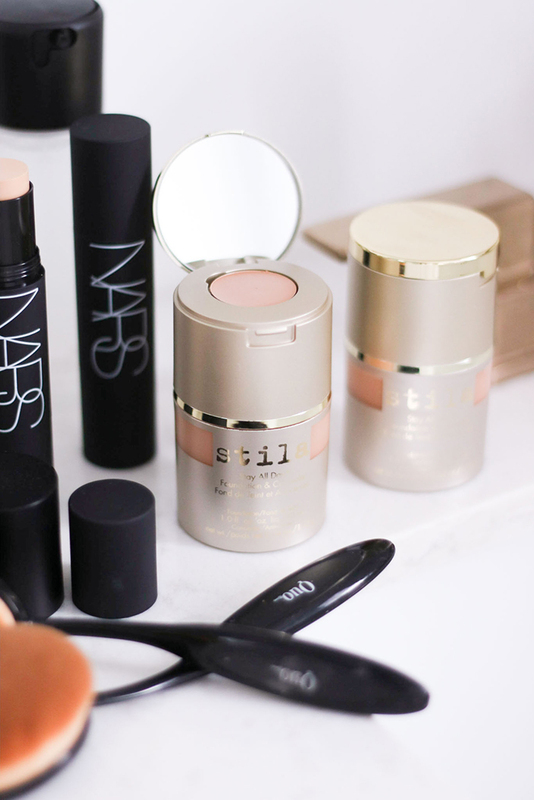 In terms of the final step to achieve a flawless finishing look. I recommend using a setting powder or spray. The MAC Prep + Prime Fix + is a lightweight water based mist that is packed with vitamins and minerals specially formulated to set and give your make up an extra boost of hydration and staying power. This spray can also be used as a primer but I love it as a last step to my make up routine. 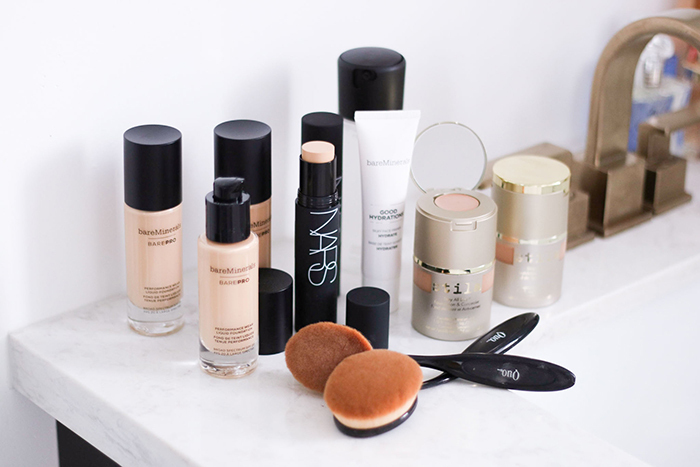 Whether you’re in the market for a new foundation or not, it’s always great to have multiple options as that allows you to switch up the amount of coverage you need or what type of make up look you’re trying to achieve. I hope this round up provided you with some extra info for your search and always happy to answer more questions or to share more experiences if you leave me a comment! What is your go-to foundation if you don’t mind me asking?